The U.S. Declared War On Veteran Homelessness — And It Actually Could Win In 2009, then-Veterans Affairs head Eric Shinseki declared that all homeless veterans would have housing by 2015. New Orleans has made big strides, but in Los Angeles, the problem persists. This is a tale of two cities. In New Orleans, there are signs of hope that veteran homelessness can be solved. But Los Angeles presents a very different picture. Daniel Harmon, a veteran of the wars in both Afghanistan and Iraq, looks out the window of his room at the Hollywood Veterans Center in Los Angeles. 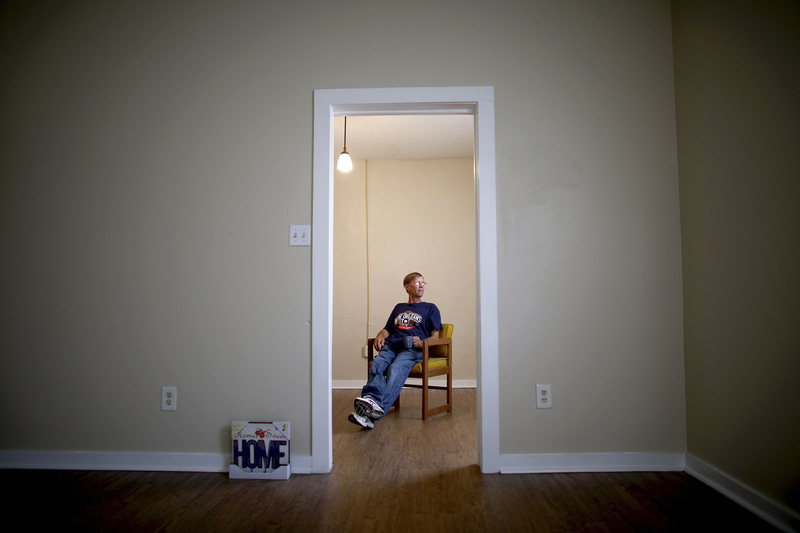 The facility provides housing to homeless vets. Under the deafening highway noise of the Pontchartrain Expressway in central city New Orleans, Ronald Engberson, 54, beds down for the night. Engberson got out of the Marines in 1979, plagued even back then by problems with drugs and alcohol. He says that's mostly the reason he's been homeless the past 10 years. "My longest stretch sober was 14 months," he says. "Being out there on the streets, it's tough." So if New Orleans has zero homeless vets, why was there a Marine sleeping under the expressway? It's called "functional zero," according to Melissa Haley, director of supportive services at Volunteers of America in New Orleans. "Homelessness is a continuous process. There's a veteran right now who is in a home who could very well be homeless tomorrow," she says. "Functional zero is defined as having a process and the resources in place where we can immediately house a veteran." So if a vet loses a job today, misses the rent and gets evicted in New Orleans, the city can get him or her housed within a month. Haley says it's often faster; they got Marine Corps veteran Ronald Engberson housed in one day. A Volunteers of America caseworker, DaVaughn Phillips, met Engberson under the expressway and started asking him questions from a survey. When he heard Engberson's name, he looked down at a list on his clipboard. "Mr. Engberson, we've been looking for you!" Phillips said. "When you said Ronald Engberson, I'm almost about to get up and shout!" Nonprofits, the New Orleans VA and the mayor's office now coordinate to keep one constantly updated list of homeless veterans. Because Engberson was on the list, his military record had already been confirmed, and Phillips could get him into an apartment. The next morning Phillips met Engberson by the expressway overpass and took him to a modest, clean apartment. First thing Engberson did was shave off his ragged beard. Engberson served a short stint in the Marines in 1979. Until recently, he had been homeless the past 10 years. "Last night I was under the bridge," Engberson said. "I'm thankful I'm inside. I have AC, don't have to deal with the rain, the lightning, people walking up on you all the time." New Orleans went from 470 homeless vets in 2011 to functional zero today, using what are now considered best practices — such as the master list — and powered by a huge cash injection from Washington. Nationwide, spending on homeless vets is up 300 percent since President Obama took office, hitting near $1.5 billion last year. That tracks with a reduction in homeless vets by about a third. "We've been able to house more vets in the last five years than at any point in our history ... 30-plus years," Vince Kane, special assistant to the VA secretary, says of the agency's housing programs. "In the past, both inside and outside of VA, we were focused on models more about managing homeless than on ending homelessness," Kane says. Part of that shift is to embrace a philosophy called "housing first." "It's about getting guys in housing first and then treating whatever ails them afterwards," says Kevin Kincey, who does outreach for the group U.S. Vets in Los Angeles. "Back in 2005, to come into a program ... you needed to be sober," Kincey says. "[Now] once you get in housing, if you need substance abuse treatment, mental health treatment, they'll wrap that around you." 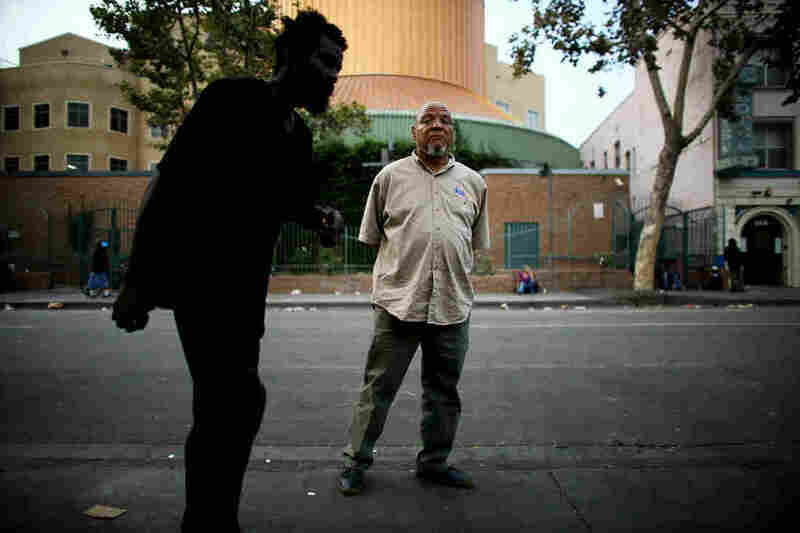 Kevin Kincey looks for homeless veterans on Los Angeles' Skid Row and helps them get off the streets. Kincey says he's seen housing-first programs arrive just recently in Los Angeles — which VA officials acknowledge is lagging behind many other cities in the race toward the goal. LA has the most homeless vets in the country. It also has a housing shortage that makes it hard to find places even with the funding available. And there were other problems — the Los Angeles VA was embroiled in a lawsuit about misuse of resources. Kane was sent this year from headquarters to get the Los Angeles VA back on track. Still, LA would need to house 3,000 more homeless vets by the end of the year to reach zero, and no one expects it to happen on schedule. Angelenos say it's not fair to compare the scale of their homeless problem to smaller cities like Houston or New Orleans. "They've all done great work, but no one has done as much as Los Angeles has done in total volume," says Greg Spiegel, who advises the mayor of Los Angeles on homelessness. For perspective, New Orleans housed 227 vets last year to reach zero. Los Angeles housed about that many last month and the month before that. LA has found homes for about 4,000 veterans since January 2014. But Spiegel says as fast as they can house them, about seven more veterans become homeless every day in LA. "That inflow of vets becoming homeless is so big, it essentially neutralized the incredible progress we made. That had never been done before and is more than anywhere else in the country," Spiegel says. Many of the vets becoming newly homeless are from recent wars, raising fears of another generation of combat vets winding up spending a life on the streets. 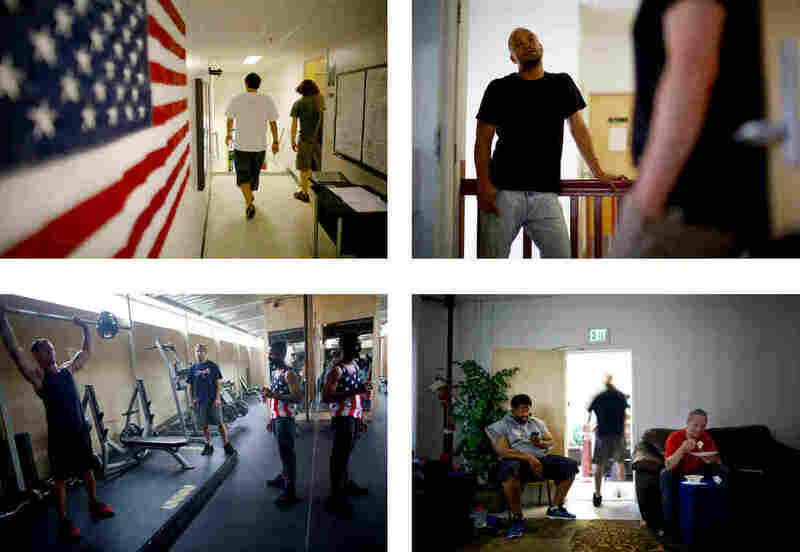 "I don't want to see these guys homeless 40 years from now," says Jim Zenner, who runs the Hollywood Veterans Center, a barracks-style halfway house for veterans of Iraq and Afghanistan. Zenner moved to LA when he got back from Iraq in 2008 and started pursuing a master's degree in social work at University of Southern California. The war still had a grip on him, though — even the LA freeway reminded him of routes he had driven in Iraq. Anger and depression put him on edge. At home with his wife and kids, he'd yell so loud the neighbors would call the cops. "The fourth time the police ... basically told me that if one of us don't leave the house, then they're going to take our kids. So I packed my stuff, slept in the car that night and then got a hotel room, took my oldest son, and we stayed there for four days," he says. After that, he had nowhere to go. He and his wife were both students. They were living off loans and GI bill money — not enough to pay two rents in Los Angeles. He went to the VA for help, but none of the shelters at that time would take in a father and son. Then a place run by Volunteers of America did him a favor and bent the rules to house them both. He stayed seven months. Then they asked him for a favor. "I did some volunteer work for them," Zenner says. "And in early 2010 they offered me a position to take an empty building and turn it into a readjustment facility for Iraq and Afghanistan veterans." That facility looks a bit like one of the makeshift barracks troops made out of buildings in Iraq and Afghanistan — right down to the free weights and boxing gear in the covered alley next to the building. There's a TV lounge and a group therapy room, too. "They try to get us to talk about it, but you know how vets are. We like to talk about it privately together. And that's the stuff that helps out the most," says Joe Scogan, who did two combat tours to Iraq. After a divorce, he wound up living in his truck. He went to stay at a VA housing program before landing at the Hollywood Veterans Center this May. "At the VA, I was there with some Vietnam vets, and they were great. But it really helps being with guys that you went through something with. They're different wars," Scogan says. Zenner says his mission is to be flexible and fit treatment around school and job possibilities, even if it means bending the rules, like they did for him when he and his son had nowhere to stay. He's got mixed feelings about the goal of ending homelessness. "I don't think it's possible," says Zenner. "And the play-with-words like 'functional zero' and all that crap — I don't like to do that. Everybody knows in LA it's not going to end in 2015. [But] it's a good way to get people to work extra hard." The deadline also has some worried. "My fear is that someone will claim victory at the end of this year and funding will start going away," says Steve Peck, president of U.S. Vets. He's already seeing it happen. This summer Peck planned to raise funds for a homeless veterans' event in Houston. Then the city declared in June that it had reached "functional zero." "It was only weeks after that we began making calls to our community partners to help us. We get donations from all over. And one of them actually said, 'Well, wait a minute, I thought we'd ended this.' "
Peck worries that once the deadline passes with the end of this year, the momentum in Washington will disappear, regardless of how many vets are still living on the street.